Quality Control Department plays an important role in producing quality garment right first time. Structure of quality control department and activities of various quality personnel in a garment export house are explained in this article. In garment manufacturing quality personnel are appointed in each section (department) to ensure quality output at end of each processes. Section QAs are appointed under each department quality heads. 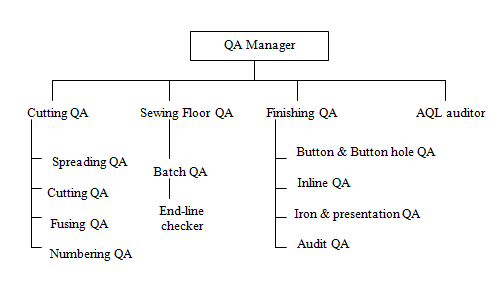 An organization chart of Quality Department of a medium size shirt manufacturing company is shown in the following diagram. Function of each QA has been explained briefly in the following table. Monitoring the batch QA and line checkers. Make a batch DHU report daily. Audit each and every production lot. Activities of departmental QAs are likely as above but not limited to these only. Add other activities if something is missing here.